Pieter Montyn came to live and work in England from the Netherlands in 1967, and was granted UK nationality in 1972. His career spans 37 years in the UK aircraft and defence equipment industry (British Aerospace/BAE Systems and GEC), in which he held senior export management positions at home and overseas. He retired from the industry in 2004. He has a Master of Science degree in aeronautical engineering. 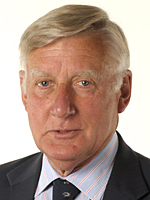 Pieter served as a Chichester District Councillor from 2006–15 and was elected to West Sussex County Council in June 2009. A widower with one son, Pieter has lived in Birdham since 2004 and enjoys gardening, walking his Labradors, and when time permits, sailing from Birdham, where he has kept a boat for 25 years. He loves water sports and was the Royal London Yacht Club Commodore from 2011-13. Pieter is the Chairman of the Performance and Finance Select Committee.